I’m back at the sewing machine and loving every minute of it! So here’s the first of my autumn makes: the Lisette Traveler Dress, view A.
I used my 1930’s-look floral charity shop fabric and was very sceptical as to how it would turn out. Having now strutted around in it for a day, I’m finally getting used to it, but more on that later…. 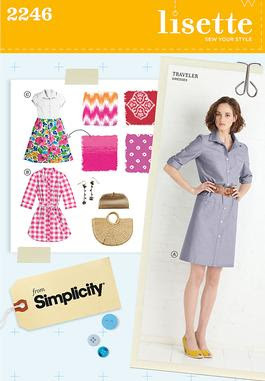 The Lisette 2246 Traveler Dress pattern is a lovely, lovely pattern to sew. It’s brilliantly drafted and the instructions are a delight – clear, simple and workable. I can see what other bloggers are talking about when they wax lyrical about Lisette patterns - I can’t recommend this one highly enough. Having heard that these patterns run quite large, I cut a size 12, even though my measurements actually belong in the size 14 column. I also decided to try the Miss Petite option on the pattern, which basically takes in a one inch tuck right across the pattern pieces, shortening the bodice length as well as the actual finished dress length. This was a good move as the final fit of the dress is just what I wanted – fitted but casual. I did a tissue fitting on my dummy and the only bit that slightly worried me was the bust. In the end it just about fits across the bust but it’s a close call. I could probably have done with an extra inch or two in that area but it doesn’t gape open so I can live with that. Sewing it together was a dream, there wasn’t one bit that didn’t make absolute sense and I even learnt a new skill - how to make shaped pockets. 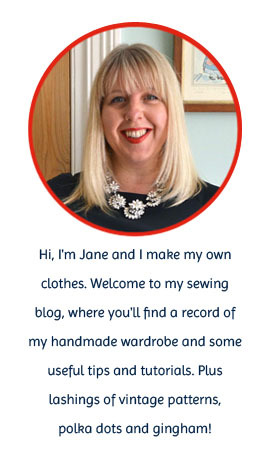 The vintage fabric is great to sew with – it barely frayed at all. It has quite a weight to it - almost like a quilting cotton – not drapey at all, but that actually works well with the style of this dress. I finished the dress off with cream vintage buttons from my stash (the red ones I originally chose became completely lost in the busy floral of the fabric). Helloo!! I’m now back from my fabulous holiday, where I spent a relaxing week making sandcastles and not much else, pure bliss. Now we're back though, I'm literally counting the hours until my two go back to school so I can get cracking with some sewing. In the interim I’ve been catching up on my sewing book reading. I’m a tad impulsive with sewing books and tend to order them in a mad frenzy; some of the time I’m disappointed, but I struck lucky with my latest purchase…. and the glamour-puss turban made from an old T-shirt, both just gorgeous. I’ve mentioned before on this blog how little vision I have when it comes to refashioning clothes, so this is the perfect book for me. 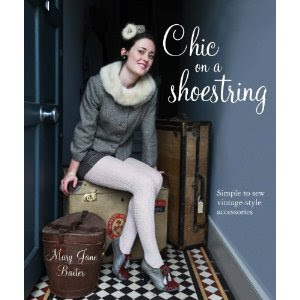 If you like vintage style or you simply want to breath new life into frumpy old clothes, then this book will almost certainly have a stylish solution. Bored with your old cardigan? Just change the buttons for vintage ones. Easy peasy. Once the pieces were cut out, it probably took about 15 minutes to sew together and although I think it would look better with a vintage buckle (which sadly I didn’t have knocking around) I’m pleased with how wearable it is.